BOOM! Studios is thrilled to continue its nationwide, action-packed 2013 convention tour with a return to Baltimore Comic-Con from Saturday, September 7th through Sunday, Sunday 8th. The publisher will be bringing along a pair of exclusive variant covers along with fan-favorite talent. BOOM! Studios is honored to host luminary author Mike Carey (SUICIDE RISK, The Unwritten) at its booths (#1303) for signings throughout the show for his only United States comic book convention appearance in 2013. In addition, KaBOOM! Studios is equally excited to welcome Natasha Allegri (ADVENTURE TIME: FIONNA AND CAKE), Mike Holmes (BRAVEST WARRIORS, ADVENTURE TIME), Noelle Stevenson (ADVENTURE TIME, Nimona), Ian McGinty (ADVENTURE TIME: CANDY CAPERS, UglyDoll), Travis Hill (CARS), and Allison Strejlau (REGULAR SHOW) signing and sketching at the KaBOOM! Studios booth (#1301) all weekend long. The publisher will also be hosting Paul Jenkins (DEATHMATCH, FAIRY QUEST), (DAY MEN, Wednesday Comics), Matt Gagnon (DAY MEN), Mike Kunkel (HEROBEAR AND THE KID), and Eric Esquivel (FREELANCERS) throughout the weekend along with signings by Archaia creators, including David Petersen (MOUSE GUARD) and Charles Soule (STRANGE ATTRACTORS). Newly acquired imprint Archaia Entertainment will be on hand at the BOOM! Studios booth with a section devoted entirely to their titles, including new releases like MOUSE GUARD: THE BLACK AXE, CYBORG 009, RUBICON, STRANGE ATTRACTORS, THE REASON FOR DRAGONS, and THE THRILLING ADVENTURE HOUR. BOOM! Studios will debut two exclusive variant covers, one from each of their two primary imprints, at Baltimore Comic-Con. From the KaBOOM! imprint, copies of GARFIELD #17 with an all-new cover by Natasha Allegri will be available for purchase. Meanwhile, from the BOOM! 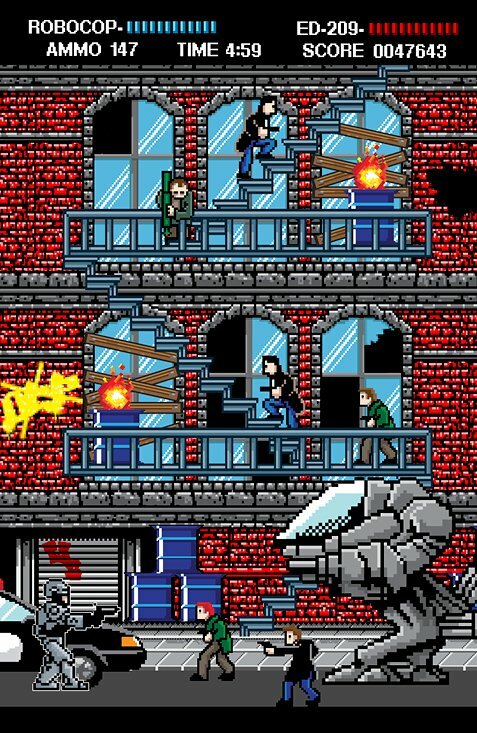 Studios imprint, copies of ROBOCOP: LAST STAND #1 with an exclusive 8-bit cover by Matthew Waite (Wolverine, Avengers A.I.) will be available for purchase. As an added bonus for convention-goers, an exclusive ADVENTURE TIME: CANDY CAPERS #3 by Fellipe Martins will be available at the convention exclusives booth and VIP ticket holders will receive an exclusive SONS OF ANARCHY #1 “Road to Baltimore” exclusive variant cover. Artist and writer George Pérez has a career that spans four decades and has the rare distinction of being one of the top creators in the comic book business consistently for the mass majority of his career. His credits are too numerous to list and his contributions to the mythology of Marvel and DC comics are profound and enduring. After over a decade working exclusively with DC Comics, Pérez is embarking on a new chapter in his career at BOOM! Studios. Join BOOM! Founder and CEO Ross Richie in a reflection of Mr. Pérez’s first four decades of work and a discussion of what the future holds for this comic book luminary. Plus, be the first to find out what Mr. Pérez’s new project at BOOM! will be! You will not want to miss this jam-packed, inspiring hour as BOOM! Founder & CEO Ross Richie and Editor-in-Chief Matt Gagnon along with special guest creators reintroduce BOOM! Studios to the world of comics. This won’t be your average publisher panel droning on and on through a series of press releases and stale cover images. Find out what makes BOOM! Studios different than every other comic publisher in the market and why 2013 has been a transformative year for us. We are BOOM! Come Innovate With Us. Eisner Award-winning writer Mike Carey’s work spans comics, novels, film, and television. Carey made his initial impact in the U.S. comic market with the longest running and most successful SANDMAN-related spinoff series from Vertigo: LUCIFER. Since then, he’s solidified himself as a nuanced, character-driven creator on other critically acclaimed Vertigo series such as CROSSING MIDNIGHT and THE UNWRITTEN; while becoming a mainstream fan favorite on series like X-MEN and ULTIMATE FANTASTIC FOUR. This year, Carey launched his first ongoing, original series from an independent publisher: SUICIDE RISK from BOOM! Studios. Join BOOM! Editor-in-Chief Matt Gagnon as he moderates a lively discussion with Carey about his career, his process, and his inspirations. Additionally, BOOM! guests Mike Carey and Paul Jenkins will take part in the British Invasion panel on Saturday at 11:00am-12:00pm. BOOM! Studios and its imprints are nominated for nine Harvey Awards, which will be held as part of Baltimore Comic-Con on Saturday, September 7 at 8:45 p.m. ET at the Hyatt Regency Baltimore Hotel. Baltimore Comic-Con will take place at the Baltimore Convention Center, located at 1 W. Pratt St., Baltimore, MD 21201. On Saturday, the show hours are from 10am – 7pm and on Sunday the show runs from 10am – 5pm. If you would like more information about the show, visit the official website at baltimorecomiccon.com. Our previously announced guests include: Josh Adams (Doctor Who); Neal Adams (First X-Men); Mark Bagley (Fantastic Four); Art Baltazar (Aw Yeah Comics!, Tiny Titans); Brian Bolland (Dial H); Harold Buchholz (Archie Comics); Mark Buckingham (Fables); Sal Buscema (Amazing Spider-Man); Frank Cammuso (Knights of the Lunch Table, Otto’s Orange Day); Jimmy Cheung (Avengers vs. X-Men); Frank Cho (Savage Wolverine); Steve Conley (Bloop); Amanda Conner (Before Watchmen: Silk Spectre); Jamie and Tyler Cosley (Cody the Cavalier, Ninja Squirrel); J.M. DeMatteis (Phantom Stranger); David Finch (Justice League of America); Franco (Aw Yeah Comics!, Tiny Titans); John Gallagher (Buzzboy, Roboy Red); Zack Giallongo (Broxo); Chris Giarrusso (G-Man); Keith Giffen (Masters of the Universe); Jimmy Gownley (Amelia Rules!, The Dumbest Idea Ever! ); Joe Hill (Locke and Key); Jason Horn (Ninjasaur); Adam Hughes (Before Watchmen: Dr. Manhattan); Denis Kitchen (The Oddly Compelling Art of Denis Kitchen); Barry Kitson (Empire); Roger Langridge (Popeye); Jim Lee (Superman Unchained); Paul Levitz (World’s Finest); Kevin Maguire (World’s Finest); Mike Maihack (Cleopatra in Space); Mark Mariano (Happyloo); Billy Martin (Vitriol, the Hunter); Dave McDonald (Hamster Sam); Mark McKenna (Star Wars, Banana Tail); Jason Mewes (Jay and Silent Bob’s Super Groovy Cartoon Movie); Mike Mignola (Hellboy In Hell); Jamar Nicholas (Leon: Protector of the Playground); Chris O>Matic (The Chris O>Matic Show! ); Jimmy Palmiotti (Batwing); Dan Parent (Archie, Veronica, Kevin Keller); George Perez (World’s Finest); David Petersen (Mouse Guard); Joe Prado (Earth 2); Ivan Reis (Aquaman); Dave Roman – Saturday only (Astronaut Academy, Teen Boat); Chris Samnee (Daredevil); Jeff Schultz (Archie, Jughead); Louise Simonson (X-Factor); Walt Simonson (The Mighty Thor); Kevin Smith (Batman: The Widening Gyre); Allison Sohn (sketch card artist); Frank Stack (My Cancer Year); Bobby Timony (Night Owls, Detectobot); Mark Waid (Indestructible Hulk), Bill Willingham (Fables); and Thom Zahler (My Little Pony). New York Comic-Con Is Calling All Villains! Sylvester Stallone And Chloë Grace Moretz Join The NYCC Line Up!